Making changes to your company after incorporation can be a time-consuming and costly process. Avoid any complications by having one of our experts review your company application and correct any errors before it is submitted to Companies House. Guarantee your company is incorporated today. 1st Formations process most applications within the advertised 3 to 6 working hours; however, due to Companies House workloads, there is no certainty this can always be achieved. If it is of the utmost importance your company is registered today, you can take advantage of Companies House’s express service, which fast tracks applications and guarantees registration before the close of business today. There is an additional Government fee for this service; however, your order will be given urgent attention by both Companies House and 1st Formations, to ensure your company is incorporated on the same day. Please note: We must receive your submission no later than 3.00pm (Monday to Friday) for it to qualify for the guaranteed same day service. The Registered Office will appear on public record as the official address of your company. With this service, our prestigious Covent Garden address will appear on public record rather than your home address. We will then scan and email all statutory company mail to you from a number of official government bodies, free of charge. Please note: The forwarding of official government mail by scan and email is free. Mail will be forwarded on a daily basis. All company directors, shareholders who are persons with significant control (PSC), and company secretaries, must provide a service address where statutory mail from government bodies such as Companies House and HMRC can be sent to them personally. This address will appear on public record, so most people prefer not to use their home address for this purpose. With this facility, our London Service Address will show on the public record than your home address. This service includes the scanning and emailing of all official government mail addressed to a company officer, from a number of government bodies, free of charge. This item provides a service address for 1 person and is renewable on a 12 month basis at a cost of £26.00 +VAT. 1st Formations' London business address service allows you to use our prestigious Covent Garden address for your day-to-day business correspondence. The Registered Office will appear on public record as the official address of your LLP. With this service, our prestigious Covent Garden address will appear on public record rather than your home address. We will then forward all official mail from governing agencies, such as Companies House and HMRC. to a correspondence address of your choice, free of charge. Please note: The forwarding of official government mail within the UK is free. Mail forwarding of official mail outside the UK will be charged at Royal Mail postal rates plus 15%. Mail will be forwarded daily. All LLP members must provide a service address where official government mail from Companies House, HMRC and other governing agencies, can be sent to them personally. This address will appear on public record, so most people prefer not to use their home address for this purpose. With this facility, our London Service Address will show on the public record rather than your home address. This service includes the forwarding of all official government mail addressed to a company officer (from HMRC, Companies House and other governing agencies) for no additional cost. 12-monthly basis at a cost of £26.00 +VAT. Please note: Forwarding of official government mail within the UK is free of charge. Forwarding mail outside the UK will be charged at Royal Mail postal rates plus 15%.Mail will be forwarded daily. Our service will automatically renew every month at a cost of £6.99 plus VAT. We will provide you with your own unique 020 London or regional telephone number. You can use this number as your new business number on your company stationery, website, advertising, etc. or you can simply use this number to divert your calls to your new receptionists. and small businesses - free consultation included. If there are any employees or directors who will be taking a salary from your company, it is a legal requirement to register your company for PAYE with HMRC. Failure to register for PAYE promptly can result in penalties. If your first payday is less than 3 weeks away, do not be concerned. You should process your salary or salaries on the date of your first payday, and complete your registration information from HMRC. If your first filing is late, HMRC will take into account the timing of your registration so there should be no issues arising from this filing. If you are a non-UK resident opening a UK limited company, you may need your company documents legalised before they can be used overseas for certain purposes, such as opening a business bank account. An Apostille Certificate is a form of authentication which can be attached to official UK documents to allow their use in other countries. Our Apostille service can be used to legalise various company documents, including your Certificate of Incorporation, Memorandum & Articles of Association and Share Certificates. You may also specify additional documents, as required, during the ordering process. Documents which are not filed at Companies House, or existing signed documents, will need to be provided by you. Our highly trained staff will prepare your Confirmation Statement, and file it with Companies House before the deadline, ensuring it is completed on time and with complete accuracy. Emboss all your company paperwork with your company name and registration number. 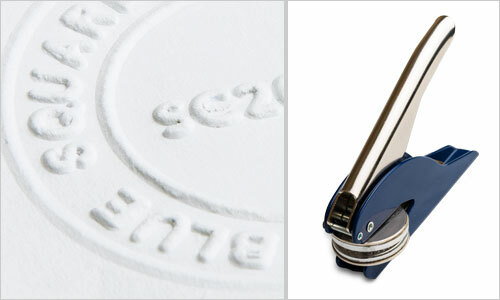 Our company seal has a hand plier design and comes with its own protective colour matching wallet. Please note: The postage of company seals within the UK is free. Posting of company seals outside the UK will be charged at Royal Mail postal rates plus 15%. The Certificate of Incorporation is a vital formation document which verifies your company’s existence. It is recommended that you have a printed copy of this certificate as it is often requested by banks and other institutions. The Memorandum & Articles of Association is an essential company formation document which outlines the purpose of the business and contains a set of rules about the management and structure of the company. Given its importance in the forming of your company it is highly recommended you have a hard copy of this document. A printed version of your original share certificate(s). This document provides evidence of your ownership of shares within a limited company. This service allows you to maintain the privacy of your home address, as our prestigious Covent Garden, London address will appear on public record as the official address of your company. We will then scan and email all statutory company mail to you from a number of official government bodies, free of charge. A printed copy of the minutes of your first board meeting where the initial resolutions of your company were passed. Although not an essential company document it can be useful to have evidence of your first resolutions and we would recommend a printed version be kept with your other documents. If there are any employees or directors who will be taking a salary from your company it is a legal requirement to register your company for PAYE with HMRC. Failure to register for PAYE promptly can result in penalties. Turnover is expected to exceed £83,000 in the next 12 months. It is therefore a legal requirement to register for VAT, unless the supplies are exempt. If turnover is expected to be less than £83,000 but the company wants to register voluntarily. We will provide you with a London 020 or regional telephone number of your choice. This can be used to divert all calls to your own landline or mobile number. Setting up a call divert is simple and can be done on any handset! Our team will be on hand to guide you through this process. 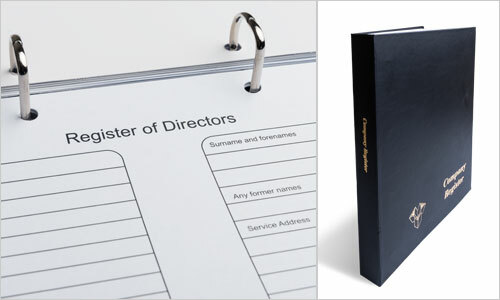 A professional and stylish hardback folder to house a full selection of company registers and additional documents. This hardback register is perfect for ensuring that your company’s statutory documents are well organised. Please note: The postage of company registers within the UK is free. Postage of company registers outwith the UK will be charged at Royal Mail postal rates plus 15%. Non-statutory general business mail is delivered to our London address and forwarded to an alternate address of your choice two times per week. Please note: This service does not include a registered office service, which should be purchased separately. All general business mail will be handled by us and forwarded to your UK or overseas address at the cost of Royal Mail postal rates plus 15%. 1st Formations process the majority of applications within the advertised 3 hours, however, as this is dependent on Companies House workloads we cannot always guarantee this timescale. If you wish to ensure a speedy registration, you can take advantage of the express service to fast track your application and guarantee your company is registered before the close of business today. Making changes to your company after incorporation can be a time-consuming and costly process. The simplest way to avoid this is by having one of our experts review your new company application and correct any errors before it is submitted to Companies House. As a non-UK resident forming a UK limited company, you may require having some of your company documents legalised before they can be used overseas. Without this you may not be able to do certain things, such as opening a business bank account. An Apostille Certificate can be attached to official UK documents to authenticate them for use in other countries. The attachment of an Apostille Certificate will ensure the documents are verified for use in all countries which are party to the 1961 Hague Convention. You can use our Apostille service to have various company documents authenticated, such as your company's Certificate of Incorporation, Memorandum & Articles of Association or Share Certificates. Any additional documents you may wish to have Apostilled can be specified during the ordering process. Any such documents which are not filed at Companies House or existing signed documents, will need to be provided by you. Please note: Documents can take up to 14 days to be certified by The Foreign & Commonwealth Office. After checkout, you will be asked to enter your new company details (director and shareholder info). If you pay for your order and then decide you do not want to proceed, we will return your money in full, as long as the company application has not been sent to Companies House for incorporation.